Are you searching for transmission service and repair in Lafayette, IN? Look no further than the auto mechanics at Guaranteed Automotive & Transmission Service (formally Guaranteed Transmission Service). In fact, dealerships and other independent car repair shops even call on our team for help with tricky transmission troubles. You just can’t leave the repair of your transmission in the hands of amateurs. And at Guaranteed Automotive & Transmission Service in Lafayette, IN, amateur would be the last word to describe our auto mechanics. 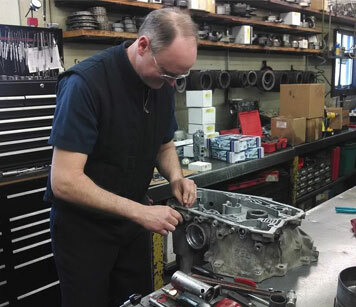 With ASE and Automatic Transmission Rebuilders Association (ATRA) certifications and years of experience, our team is ready and able to perform thorough and accurate transmission service and repair. In 1983, Guaranteed Automotive & Transmission Service began as a car repair shop focused on the repair and service of transmissions. This speciality has earned us as a reputation as being the go-to place for transmission service and repair. We stand behind our work with a variety of warranty options. Ask for warranty details. While you drive around Lafayette, IN, you can breathe a sigh of relief, knowing your transmission service and repairs were made to last. When we say we care about you and your car, we mean it. As a family-owned and operated car repair shop since 1983, you can tell we put our heart and soul into delivering you a personable and courteous experience. Combine our commitment to honesty and integrity with our expertise for transmission service and repair, and you can see why we are the ones Lafayette drivers turn to when their vehicle needs service. Schedule an appointment online , or stop by Guaranteed Automotive & Transmission Service at 3742 State Rd 38 East. Lafayette, IN 47905.